Receive an e-gift card up to $400. 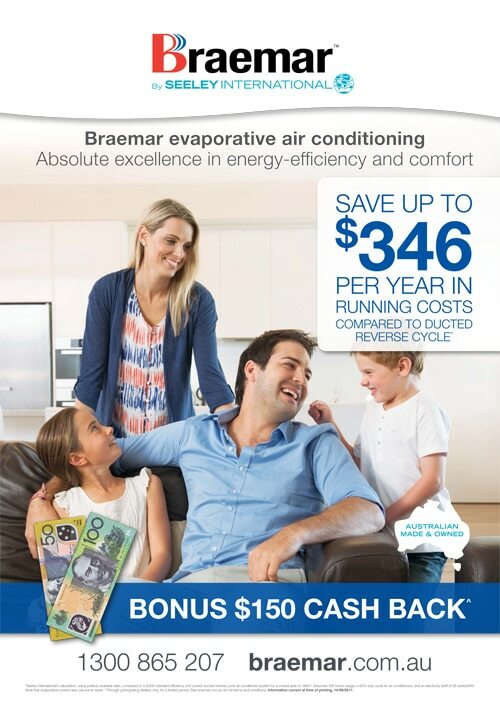 Purchase and install a Braemar evaporative air conditioner from a participating dealer between 1st October to 31st October 2017 and you will be eligible to receive $150 cash back from Seeley International. The “closing date” for this offer (the last date for receiving cash back applications) is 13 December 2017. To find a participating dealer visit the Braemar Dealer Finder and look for the ‘Cash back’ button on the dealer profiles. Please check with the dealer that they are a participating cash back dealer. Whether you want to keep warm or cool, with Bonaire, you hold the cards. 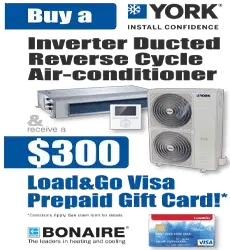 Purchase a Bonaire 4 or 5 star ducted gas heater, or a selected Bonaire evaporative cooler, and receive a $200 Load & Go VISA card. 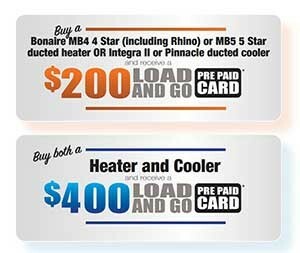 Purchase a Bonaire Heater and Cooler, and receive a $400 Load & Go VISA card. 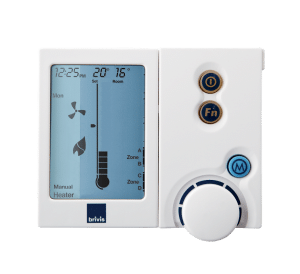 All Bonaire models use the latest technology, and are highly efficient, providing big savings on your energy bills. To take advantage of this great offer, call 1300 BONAIRE, or find your local dealer below. Promotion runs from 1st July 2017 – 31st August 2017. 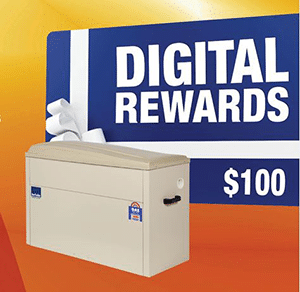 Purchase a Brivis Starpro 4, 5 or 6 star Gas Ducted Heater you are eligible to receive $100 Gift Card. 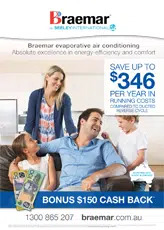 Purchase a Brivis Promina evaporative cooler and receive the popular Brivis Contour at no extra charge. Offer also includes a free networker. Unit includes five-year warranty plus two additional years when you organise a service with the manufacturer. Conditions apply. 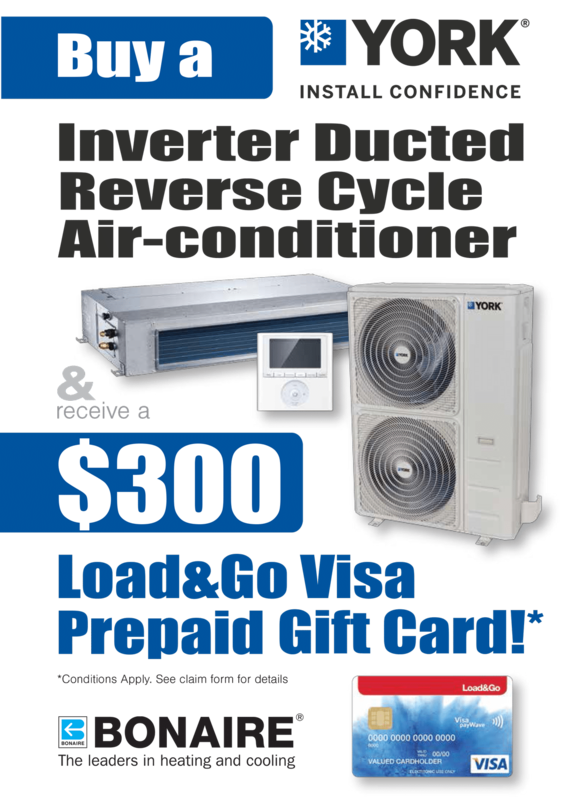 Save up to $600 on the whole Bonaire evaporative cooling range. Premier dealers (us) can offer their customers (you) 7 year unconditional manufacturers warranty and a 6 year installation guarantee. To find the right system for you call us now!